Tag line: "1974. 1350 feet up. The artistic crime of the century"
With its talking head interviews and archival footage, 2008’s Man on Wire certainly looks like a documentary, yet the manner in which director James Marsh presents the material makes it feel more like a crime thriller, relating the story of a master thief who, instead of money, stole the spotlight, and, for a brief moment, captured the attention of the entire world. By way of home movies (shot by Petit and the others), Marsh shows us the early stages of this grand scheme, and the preparation that went into making it a reality (in one scene, Petit sets up a wire in a small park in France, then has his friends shake it wildly while he’s on it, to ready him for the strong winds he may encounter during his historic walk). There’s a sense of excitement, even whimsy, in these sequences as Petit and the others formulate their plan, but the mood changes as the big day draws near. Feeling they needed outside help, Petit recruited David Forman and Alan Weiner, two Americans, to assist, much to the chagrin of Jean François (who didn’t trust either of them). Then, on the night of August 6th, the conspirators made their way to the top of the Trade Center towers (Petit, Jean-Louis and David in one building; Jean-Francois and Alan in the other), only to find guards were still patrolling the area. It’s the first of several problems they encountered, and by way of some slick reenactments (with actor David McGill standing in for Petit), Marsh successfully conveys the drama and tension of that fateful night, presenting it as if it was a well-planned bank robbery, and putting us smack dab in the middle of it all. Then we have the stunt itself, which is nerve-wracking and beautiful all at the same time (knowing that Petit survived the walk didn’t calm my nerves as I watched it, and I had to look away when he laid down on the wire and gazed up at the sky). Yet as amazing as his accomplishment was, it’s Petit himself, so full of charm and energy, that makes Man on Wire such a fun movie, and it’s the joy he displays while discussing the endeavor that will stay with you once the film has ended. This is an amazing film. You hit the nail on the head when you said early on that it looks like a documentary, but feels more like a crime thriller. 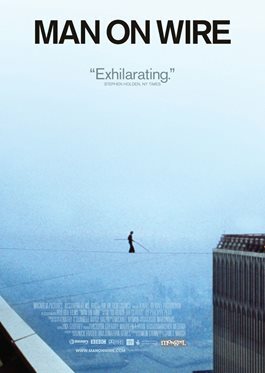 I haven't seen The Walk, yet, but it's got a lot to live up to as this is one of my all-time favorite docs.